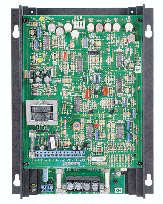 The KBRG™ Series features full-wave regenerative drives that can operate DC PM or Shunt motors in a bidirectional mode. Being a regenerative or four-quadrant type, KBRG™ drives provide forward and reverse torque in both speed directions. This means the drive can maintain constant speed with overhauling loads and provide rapid instant reversing and controlled braking. It has a variety of selectable jumpers and adjustable trimpots, which allow for custom tailoring for exact requirements of the application. Although the KBRG™ is factory set for armature feedback, thus providing up to 1 percent load regulation over a motor base speed of 50:1, it also has tachometer feedback if superior regulation is necessary. To change from a speed control to a torque control, the mode jumper J7 can be reset to the TRQ position. The drive can be operated with either a 2 or 3 wire start/stop circuit, or it can be started from the AC line. Dedicated relay contacts can be used to turn on or off corresponding equipment or to sound an alarm if the drive stops. Other features include a 5K remote potentiometer, Overspeed Protect Circuit, Auto Inhibit® circuit, Led’s for diagnostic purposes and to indicate the mode of operation, and a high speed current limit circuit.